We are at that time of the year when Manchester United, as a moral obligation, are incessantly linked with the best players in world football. It has come to this unique juncture in time where it has become effectively difficult to find that player among the score of world-beaters who hasn’t yet been linked with a lucrative move to The Theatre Of Dreams. Manager Louis Van Gaal has already procured the services of Memphis Depay, Matteo Darmian, Morgan Schneiderlin, Sergio Romero and more importantly, football royalty for all intents and purposes, Bastian Schweinsteiger. So why the doom and gloom? Despite the plethora of players walking through the doors of Old Trafford this season, United still haven’t reinforced in two of their most crucial departments; defence and attack. Contrary to the popular opinion on social media, United’s defence is not as bad as some claim it to be. In fact, to the horror of rival fans, United’s apparently substandard bunch of defenders are statistically the best unit in the Premier League. The Reds have conceded just 23 goals in the Premier league since November last year seven less than second-placed Chelsea, the reigning champions. The back four of Darmian, Chris Smalling, Daley Blind and Luke Shaw has been nothing short of exceptional this season having already kept two clean sheets in the opening two games in the league. It could be argued, and legitimately so, that the team hasn’t been tested by the big guns yet. But so far the signs have been encouraging. With Marcos Rojo, Paddy McNair, Phil Jones, Antonio Valencia and Tyler Blackett in reserve, United will not quite necessarily incur a catastrophe upon themselves by not signing a top-class centre-back. Throwing imprecations at Van Gaal who saw his team concede just a paltry sum of 23 goals in over nine months does not bode well with our suspiciously inflated egos anyway. It’s crisis at the other end of the pitch that requires immediate remedy. Manchester United need a goalscoring centre-forward. Despite being linked with Barcelona’s Pedro Rodriguez unremittingly for more than a month, it looks like the Spaniard is on course to join Jose Mourinho at Chelsea instead. The reason that is being cited is that Van Gaal himself pulled the plug on the deal. Evidently, this has not gone down well with the fans, who know for a certainty that there is little hope for United’s slender title aspirations without a proven striker. 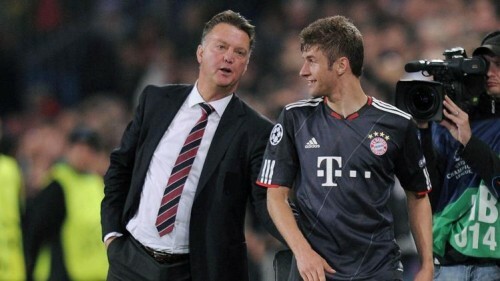 Then there is Bayern Munich’s Thomas Muller; the Wesley Sneijder reincarnate when it comes to United and transfer windows. The difference between Sneijder and Muller is that the former was consistently attainable but a deal never came to fruition. United, despite being a financial gargantuan in the sporting world, have little to no chance of signing Muller, though. Bayern Munich’s chief executive officer Karl-Heinz Rummenigge recently confessed to German magazine Sports Bild that they would be out of their minds to sell Muller. Which is justified considering they also sold Schweinsteiger, who has always been more than just a player for Bayern, this summer. The Bavarians are yearning to distort a financial divide between English and German clubs and Muller is at the centre of their seemingly political agenda. So as of now, Muller moving to Old Trafford looks as unlikely as Lionel Messi donning a Real Madrid jersey and kissing its badge. Where does this leave the Mancunians? The transfer window closes in less than two weeks. Did Van Gaal wait this long to test his youngsters? James Wilson, Andreas Pereira, Paddy McNair, Jesse Lingard and co. were phenomenal in the pre-season. Adnan Januzaj is once again enjoying his lost stardom and looks to have cemented his place in Van Gaal’s first team. Memphis Depay announced himself on the European stage with a performance that echoed a young Rooney ripping Fenerbahce to shreds a decade ago. Luke Shaw has put last season’s miseries behind and made a bright start to what could be a long and illustrious footballing career. If the game against Club Brugge is anything to go by, Marouane Fellaini is a handy back up to chip in crucial goals on important occasions. Telltale signs of a future not as awful as some predicted. Wayne Rooney has always been a player who needed a long pre-season to get his sharpness back. And with time, and a bit of service from the midfield, he will start scoring goals. And if memory serves, United have had a penchant for doing serious business on deadline day in recent years. Fellaini, Blind, and Radamel Falcao among others, were products of crucial deadline day negotiations. With nearly two weeks left before this summer’s transfer window closes, Van Gaal and Ed Woodward have ample time to add to their already fantastic arsenal of players. Will Manchester United's 3 summer targets help them pose a challenge for the title next season?